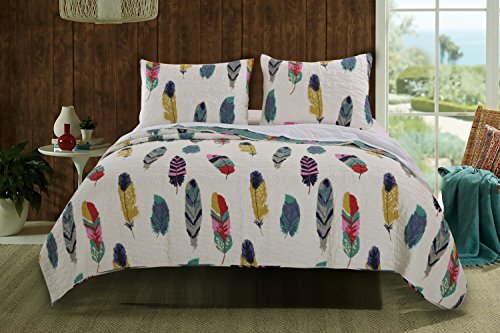 Colorful feathers billow on the breeze in the Dream Catcher quilt set. Let the Western wind summon the peaceful spirits of slumber. Face print features red, crocous, blue, gold, teal and gray pinions on an ivory ground. Wind-swirl quilting throughout. Reverses to a coordinate feather print on teal blue for two looks in one! Oversized for better coverage on today's deeper mattresses. Prewashed and preshrunk. Machine quilted with fabric bound edges for durability and surface interest. Quilt set comes with quilt and two pillow shams (one sham per Twin set). Dimensions: Twin set includes one 68x88" quilt plus one 20x26" pillow sham, Full/Queen set includes one 90x90" quilt plus two 20x26" pillow shams, King set includes one 105x95" quilt plus two 20x36" pillow shams. Dimensions +/- 2". Machine Wash. 100% Microfiber polyester face; 100% cotton back; Fill is 70% cotton/30% polyester.